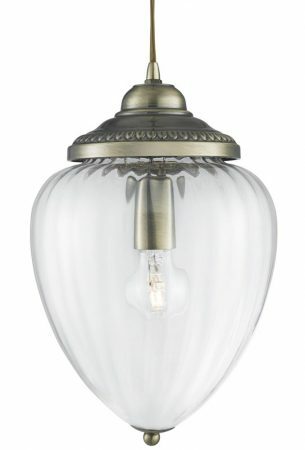 This traditional antique brass finish clear ribbed glass hanging lantern pendant is a beautiful addition to any bedroom, living room, dining room or hallway. Featuring circular ceiling mount, gold flex suspension and optic glass teardrop shade containing a single light bulb. This hanging lantern brings a traditional feel to any room in your home and looks stunning too. The shapely ribbed glass shade features a classic lower finial and ornate antique brass finish carrier at the top and the light ripples through the ribbed glass shade to beautiful effect. Height adjustable at the time of installation by shortening the supplied cable; please see below for dimensions. This stylish light is supplied by Searchlight who manufacture some of the best traditional and modern classic designs such as the traditional antique brass finish clear ribbed glass hanging lantern pendant you see here.